As well as the rewards and pleasures associated with military life, there are particular demands and challenges that come out of the special nature of life in the Armed Forces. There are many layers of welfare support available. Contact details are on the link below. Also included is a brief history of the former WW2 Army Commando's Benevolent Fund, which is now managed by the Army Benevolent Fund. The Commandos' Benevolent Fund (CBF) for WW2 Army Commandos is now managed by the Army Benevolent Fund (ABF), also known as The Soldiers Charity. They deemed this necessary as the number of applications for assistance to them were so few in recent years. The CBF, a registered charity, transferred their funds to the ABF, the national registered charity of the Army, setting aside £25,000 bequeathed to the Commando Veterans Association, which is not a registered charity, this money being for the upkeep of memorials, and provision of poppy wreaths for the next 10 years. I cannot think of a better charity than the The Soldiers Charity to now manage the fund under their own name. But why was there a need in the first place for a Benevolent Fund. Well times were different when it was set up and this article is to give a simple insight into that. 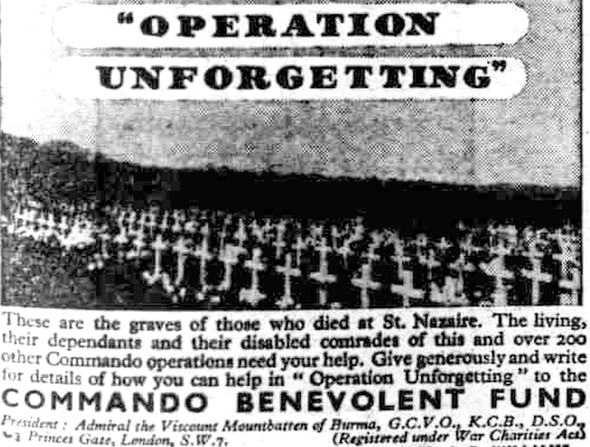 At the end of the war in 1946 a big push for fund raising was made across the UK and became known as Operation Unforgetting, or the Commandos Last Raid. Much of this fund raising took place between the 10-16 June 1946 which became known as Commando Week. By this time Parliament had made its decision to disband the Army Commandos and most were already indeed disbanded. There was widespread support and publicity for this fund raising. The money was for the Commandos' Benevolent Fund which had been set up in 1943 by the Chief of Combined Operations. "When the men volunteered for Special service they entered a new Corps, with no old established Benevolent Fund. There are a thousand ways in which money is needed for the amenities of service life and relief of distress." "Launched to alleviate the hardships that the disabled of this gallant band of men, and the dependants of those who gave all That England Might Live, are now undergoing through lack of funds. Never have the Commandos failed to carry out any operation allotted to them, however impossible it sounded, so please therefore help them in their last great task." "These are the graves of those who died at St Nazaire. The living, their dependants, and their disabled comrades, of this and over 200 other Commando operations need your help. Give generously and write for details of how you can help in Operation Unforgetting." Times were different then. The Welfare State as we know it and the National Health Service did not exist before the war. Many WW2 Army Commandos had seen little or no service with the Regiments, from which they were attached to the Army Commandos, after they had volunteered. I have had the great pleasure of meeting many Commando Veterans over the years who had been in civilian jobs before the war, enlisted when the Country needed them, and returned to civilian life when the task had been completed. It was right and proper that a Commandos' Benevolent Fund should be supported after the Army Commandos were disbanded. The Commandos' Benevolent Fund role and purpose was to help ex Army Commandos of WW2, their widows, parents, and dependent children. It was a separate and independent charity trust in no way responsible to the original Commando Association. It was answerable only to the Charity Commission. Over the years the Commandos' Benevolent Fund and those elected to manage it, their Trustees, have been pivotal in providing support and assistance to the WW2 Army Commandos who were in need of help. They continued this throughout their existence. The care they showed never dwindled. Until recently the former Commando Veterans Association President, Brigadier Jack Thomas CBE, was a trustee. Jack is in his 90s now as is Mrs Desiree Roderick MBE, again a former trustee, whose brother Captain Joe Houghton MC, No 2 Cdo., [more....] was executed and whose husband Captain Richard Broome, No. 2 Cdo. [more....] was killed in action. I would personally like to express my thanks and best wishes to them, and to the other Trustees for their dedication and service to help those WW2 Army Commandos that the Commandos' Benevolent Fund was set up to help. Todays Commandos and Veterans also need support, and thank goodness there are now a wide range of support networks for all those who serve, or have served, in the Armed Forces. The big Military Charities now work together when needed for the long term benefit of individuals. Below are just a few of the excellent Registered Charities. Army Benevolent Fund (The Soldiers Charity ) provides support to all soldiers and veterans from the British Army, and their immediate families, when they are in need. The Esprit de Corps of the Commandos' Benevolent Fund lives on in the Army Benevolent Fund. SSAFA offers help and support to all serving members and former members of all ranks of the Armed Forces, widows, and dependants. Where needed SSAFA will coordinate its response with other military charities. Also the Royal British Legion, Help for Heroes, Combat Stress, and so many others listed on our Home Page, and on the link at the foot of this article. All are there to help those who serve, or have served, in the Armed Forces. For the Commando Gunners there is the additional help available from the Royal Artillery Charitable Fund for all members of the Regimental family in need, whatever the cause, and at any time in their lives. For the Commando Sappers there is the additional help available from the Royal Engineers Association Benevolence to provide financial and other assistance to all serving and former members of the Corps, their spouses, widows, widowers and dependants who are in need through poverty. For the Commando Loggies the Royal Logistic Corps Association Benevolence provides grants to individuals, for relief in need. Registered Charities like the Not Forgotten Association, a Tri-Service charity provides entertainment, leisure and recreation for the serving wounded, injured or sick and for ex-service men and women with disabilities. Kartforce gets injured troops into the exciting world of Motorsport through Karting. If you are unsure what is available ask them. You might be surprised at exactly what is available. Written by Pete R. Website Archivist. Image: Gloucester Citizen - Friday 11 October 1946. View the websites of the above and many other organisations here [Welfare and Support]. The Secretary of the original Commando Association produced a document about the Commandos' Benevolent Fund a copy of which we have in our gallery. Read it here: Commandos Benevolent Fund.